There are two new Business Continuity books coming out this summer that are likely to find their way on to the book shelves of many of our readers and partners. They are chalk and cheese in their content, but significant publications as they address two topics that feature highly in the questions we receive here at the Continuity Forum. The first title is the Business Continuity for Dummies published by John Wiley & Son and is targeted to provide a basic introduction to Business Continuity Management to those new to the process. The second is published by the BCS - the Chartered Institute for IT and is titled Business Continuity Management Systems: Implementation and certification to ISO 22301. For many years one of the most consistent questions we have had, especially from those coming to BCM for the first time, has been, "what would we recommend as an introduction?" 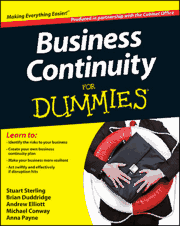 and we can now add the Dummies Guide to the Practical Business Continuity Management. More recently, since the launch of ISO 22301, and perhaps at the other end of the scale, the questions have been centred on getting good advice on how to implement the new ISO Standard; and with virtually perfect timing, Hilary Estall brings us her Guide to Implementing ISO 22301. Following many successful Events held by the Continuity Forum, a number of our members and associates have requested that we run a special Programme of BCM Development Events. These events can be tailored to specifically meet the needs of our members, partners and other organisations. Aimed at those looking to develop their Business Continuity skills, or those at the very start of the BC Planning phase within their organisation, these events are specifically to help ensure that your planning is as efficient and effective as possible.